I am a new owner of a Cobalt 233 Cuddy. Of course it’s a 1996 model, but it’s new to us, and it looks and runs like a new boat. 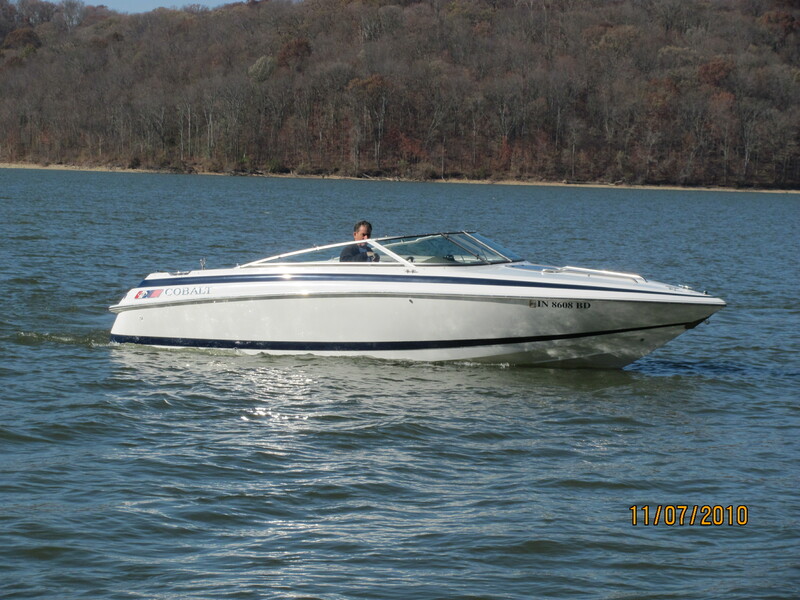 We have been boaters for many years mostly at Lake Erie with larger boats. We recently sold our 2002 – 31-PC Formula Cruiser so that we could spend more time on inland lakes with our grandchildren. I am interested in reading about anyone who has owned or now owns a 233 Cobalt. What has been their experiences on the water with this boat? What are the pros and cons (if any) regarding this great looking cuddy? 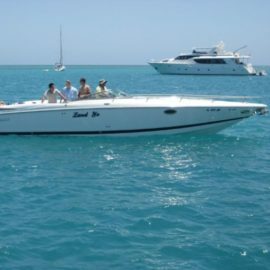 How does the Cobalt 233 Cuddy with a 5.7 lx-4 Bravo III compare to other boats of that vintage? And, if you have owned one of these boats, what are the pros and cons? I know the reputation of Formula, and we are hearing about the excellent reputation of Cobalt. It seems they are very similar companies with outstanding products. We are just anxious to know about this specific boat from present or past owners. Please email me, Donald (Chip) Cassidy or post a comment here. I have not owned a 233, but, I have owned 3 Cobalts over the years (each used) and in my opinion the best aspect is the support of the dealers and the factory. They are not completly “bullet proof” boats and will need some repair as they get older. I think you will find that with a little work and the support I referenced you can keep your 233 like new. Cobalt switched to a reduced deadrise hull design in late 80′ and early 90’s and this improved the effeciency and stability. It hurt the rough water ride some. Compared to ther boats on water I am familer with (west coast inland lakes) they ride very well. My advice is to get to know your local dealer and send a little service $ thier way. That relationship will be very helpful keeping the little things right. I doubt you will have any issues with the boat systems or hull. Enjoy your 233 and the time-less Cobalt look! Thanks so much for your advice. We are looking forward to our experiences with our Cobalt. I am sure it will be a great boat like everyone says it will be. Our sales person has become a friend and will continue to provide insight and assistance to us. The 233 is a great boat in freshwater – we used ours mostly in lake washington in seattle. Many things about the 233 are great – ours held up really well over the years. The only thing i would have added if i knew what i know now is a swim platform on the back – it really adds a level of convienience that the 233 didn’t have. If it has been looked after, you won’t regret this boat. I think I bought the 233 from Lake Washington above and we love it! This is our first boat and we decided to go with a 15 year old Cobalt over a 3 year old Bayliner or SeaRay because of the build quality, standard power, classic looks, dealer support and ride and handling. The only cons I can think of to owning a Cobalt is that they are significantly more expensive on the front end. That being said, I feel they hold their value better than most other brands so if you get a good deal, you’ll be ok.
On my boat, everything works with the exception of my depth finder. I can’t get it to work and can’t seem to trouble shoot exactly where the issue is. The transducer is directly below the 7.4 liter and nearly impossible to reach. I’d like to keep it OEM, so if anyone has any suggestions let me know. Other than that, most of the issues I’m running into are just a function of the boat being older and I’m expecting to have to do some work. Enjoy your 233, we certainly enjoy ours! I hope it was our old 233 because it’s a great boat. A friend of ours runs operations at Seattle Boat & he found that (+ our 263) for us. The depth finder never worked & its kind of a moot point on Lake Washington – the stuff that grows on the bottom of the lake usually is 2-4 ft deep & makes any depth finder reading unreliable. I have the exact same issue with the 263. See you out there some time – my 263 is black with a red stripe. Unfortunately, the 3200 is no longer made. Only gauge we currently have that would fill the hole is LST-3800, but would use different wiring. I need to change the bulb in the running lights on the stern of my Cobalt. Do I need to remove the lights or does the cover snap off? Also, I looked in my owners manual and it notes the fuses being located behind the dash..I looked under the dash but could not see them. Any help would be great.